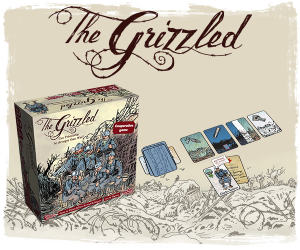 The Grizzled is a cooperative card game, designed by Fabien Riffaud and Juan Rodriguez, and published by Cool Mini or Not. 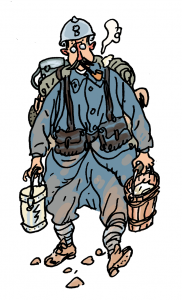 2-5 players become a band of soldiers trying to survive the horrors the trenches of World War I. You win or lose together. Each player selects one of six soldiers, each with their own unique “good luck charm” to help protect them from one of the horrors of war. Cards are divided into two face-down decks. One deck is placed on top of the dove card, and represents the trials that must be faced before the war is over. The other deck is placed on top of the monument card, and represents your team’s morale. If morale is exhausted (all cards in that deck depleated, revealing the monument card, your team didn’t survive to see the end of the war. The players are also given a number of support tokens, which give them the opportunity to help each other remove adverse conditions, or recharge their good luck charms. During each mission, players take turns playing cards from their hand, either to advance the mission, or to apply negative “hard knock” cards on themselves. Having three trials of the same type in play causes the mission to fail. At the end of the mission, if the war is not yet over, the team’s morale drops. A number of cards will be removed from the morale deck and placed on the trial deck. The goal is to empty the trial deck, revealing the dove card, and have no cards remaining in players’ hands before the morale deck is depleted. The Grizzled is a game that feels more like it’s playing you – but in this case, in a very good way. The game feels very thematic, despite the simplicity of design. It’s easy to become immersed in the aesthetics and really FEEL like you’re facing insurmountable odds and terrible conditions. The artwork certainly contributes to this. You’ll agonize over which card to play, as you’re often in a position of chosing the lesser of multiple evils. Just as you think you have a strategy figured out, someone else will play a card that completely wrecks your plans. Do you risk a mission failure by playing a particular card? Or do you instead withdraw, knowing that NOT playing that card means that the morale drop at the end of the round will be worse because of it? And you make that decision on your own, as communication between players is limited. 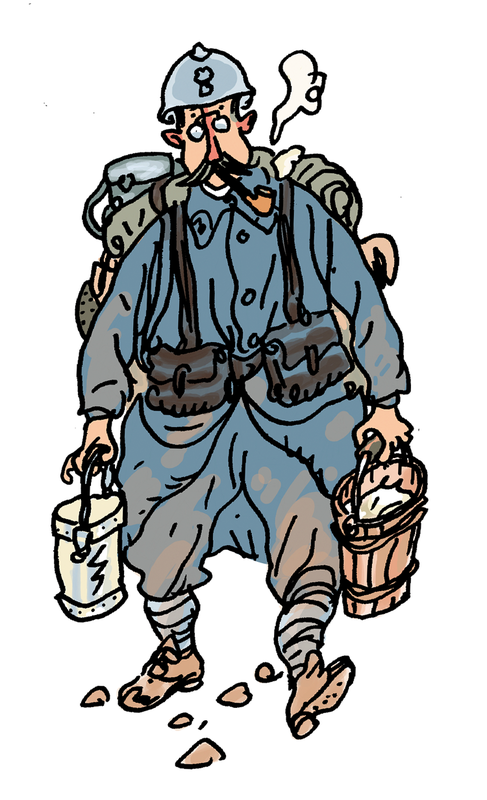 The Grizzled is an emotive game, particularly when you understand that some of the soldiers represented in it are not only real people who fought in the Great War, but are the ancestors of the people who made the game. And the artist, Tignous, was one of the victims killed in the Charlie Hebdo shooting early in 2015. This, coupled with the theme, gives this game WEIGHT. It may be a light coop game, but it feels much heavier than that. You’re not trying to take out machine gun nests or slaughter enemy squads. You’re just a band of brothers trying to survive until the end. And it isn’t easy. This is a very challenging game. This is a fantastic little game that will be getting a lot of playtime at my house. Even the young teen players in our regular group enjoy this, despite the fact that it’s more mood than action. I’d recommend this to most of my gaming friends.